Caribbean Lifestyle Media-Dancehall/Reggae music has been through a lot this past year. The list of achievements and flops are too many to mention. As we usher in a new year, the chatter about change needed in Dancehall/Reggae industry has been gaining momentum, as twitter pages light up with lively discussion about the state of the Dancehall/Reggae music business. In recent media reports and industry rumblings, Vybz Kartel and Stephen "Di Genius" McGregor was reported to be having a fall out. Vybz Kartel released a diss tune "Rifle shot" last year, clearly directed at Di Genius and others. At approximately 12:00am on January 1st, 2009, to celebrate the dawning of a new era in Dancehall/Reggae music. 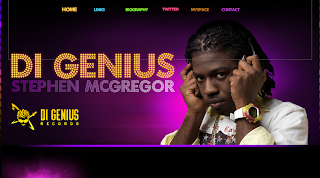 Johnny Wonder released the first Dancehall song for 2010 "Cyaan Friend Again" by Stephen "Di Genius" McGregor, this is said to be a response to Vybze Kartel and will be De Genius only response to anyone from the Portmore Empire.